Developed in 2009, CurrencyFair is an online peer-to-peer money exchange service provider. It is based in Ireland with branches across Europe and Australia. Its existence resulted from expatriates’ need to send money cheaply across borders between their homes and countries of occupation. The simplest way was exchanging it directly with friends who had corresponding needs; this led to CurrencyFair. Over the years, CurrencyFair has provided money transfer services globally, dealing in eighteen currencies. 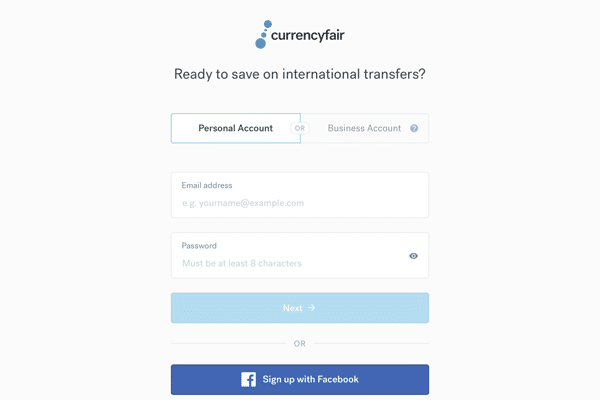 Short: Get your first CurrencyFair money transfer for free now! Watch this video below to get a more detailed impression about securing the best currency exchange rate with a CurrencyFair money transfer. The CurrencyFair app is available on Google Play and App Store. For one to use CurrencyFair service, he/she must create a user account by clicking on the sign-up option. The account must be verified to complete registration. Copies of the ID or driver’s license are uploaded to the webpage for verification of the account. Address documents are also required. 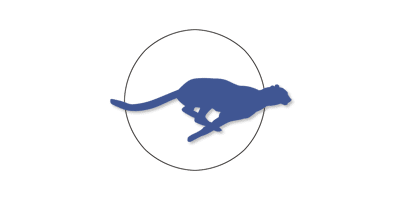 The services can also be accessed from the CurrencyFair website currencyfair.com for those without the application on their phones. Once the account is set up, money can be sent across borders. The choice on whether to send money to a recipient or keep it in CurrencyFair account is made. For a transfer to occur, one must deposit money in a CurrencyFair account. Upon transfer of money into the CurrencyFair account, money is exchanged into desired currencies. One can either exchange it immediately at CurrencyFair best rates or wait for the desired exchange rate. This decision is entirely left to the customer. By choosing either of the exchange options, one gets better rates than those provided by banks. The next step involves the customer entering the names of the recipient with their account number for transfer. A complete transfer takes a few days, but shorter than banks. The CurrencyFair fees is usually a paltry 3.00 £ or its equivalent. This is way cheaper than what most banks charge. Once money has been transferred to the sender’s account, it is converted into recipient’s desired currency, depending on their location. The converted money is then deposited in the recipient’s local bank account in the resident country. In most cases, money is paid into CurrencyFair accounts through bank transfers. Irish debit cards are also acceptable by CurrencyFair. Upon payment, an email is sent to the sender to acknowledge receipt and also allow them to proceed with exchanging currencies. Compared to banks and international financial institutions, CurrencyFair transfers money faster. With partnerships with many financial organizations, CurrencyFair makes payments faster. Upon complete transfer, recipients easily access their money at their local bank branches. How long does it take to transfer money into a CurrencyFair account? The duration varies, depending on the currency type. 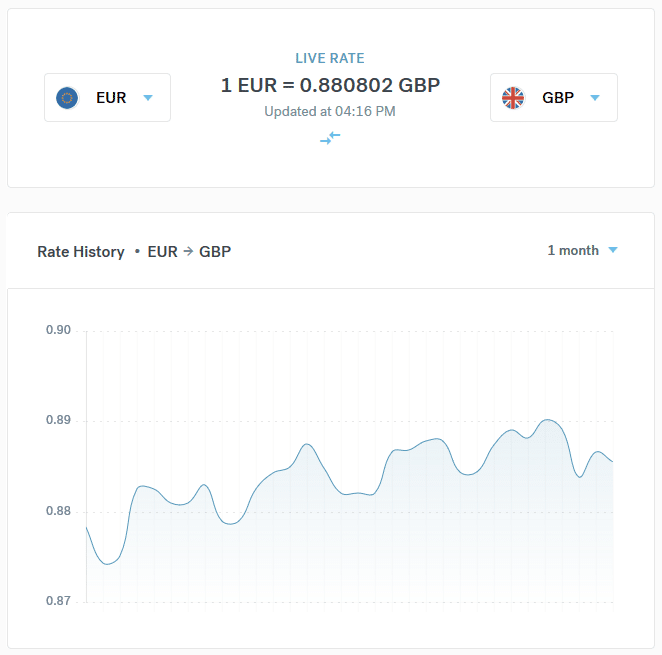 Euros take two days, whereas GBP Faster Payments and CHAPS take only a day to be complete. Other currencies require bank transfers which could take about five business days. Sending money into CurrencyFair account is free. However, it is important to note that the banks may charge their fees to facilitate the transfer. Customers with inquiries on the transfer fees charged by banks are required to liaise with their banks for more information. The CurrencyFair fee charged as seen above is little. Compared to banks and other transfer services, CurrencyFair is way cheaper and affordable to customers. The first transfer is free, something many users are likely to enjoy and be attracted to. CurrencyFair does not have brokers who exploit people transferring money across borders. It is estimated to be 90% cheaper than other money transfer services. This means that users save more, spending little on money transfer. Every time a customer uses CurrencyFair, they save money. Without brokerage fees and bank charges in money transfer, the recipient is saved the hustle of undergoing the long tiring traditional international money transfer process in banks. They merely go to their banks to receive the money sent. Being regulated by international financial regulators such as the Central Bank of Ireland, CurrencyFair is reliable and trusted to serve customer’s needs in money transfer. Customer’s money is put under maximum security. One crucial advantage of CurrencyFair is its availability. From many countries in the world covered by CurrencyFair, a user can access services using an internet enabled device. Since the internet is used for money transfer, the issues of paper transactions are eliminated. One only needs internet access to conduct a process that would otherwise bury them in paperwork. Many of its customers who have reviewed services of CurrencyFair vouch for its dependability, low cost, and safety of money. The quality of its support team has also been noted and lauded. As it is, about 82% of its real customers think the service is excellent. However, there are those still disturbed by how long it takes to send and receive money. In general, Trustpilot ranks CurrencyFair as an excellent service provider. Also, it is rated at 9.2 by Trustscore. If this is anything to go by, CurrencyFair is one the best money transfer companies, featuring among the top ten in the industry. 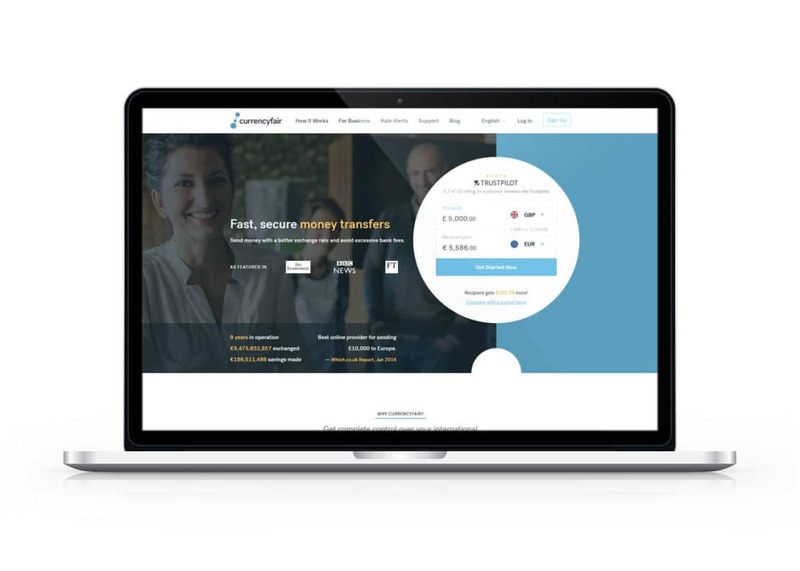 Unlike other transfer services, the currency exchange decisions are controlled by the customer, given that they can choose rates to exchange their money. As such, one can select rates that favor them. Although it may be argued to be time-consuming, the financial benefits inherent are worth the wait. CurrencyFair has a stable support platform to address customers’ concerns, available on its website currencyfair.com/support/en/. Different issues have been responded to, ranging from how to initiate a transfer to registration processes among others. In Africa, South Africa stands out as the hub of CurrencyFair. People can send money in South African Rands cheaply and faster using this service. Studies in the currency market in South Africa dominated by big commercial banks show great exploitation. The banks charge high currency conversion charges. For instance, one would save about 349.00 £ when using CurrencyFair, rather than local banks when they convert ZAR200,000 to EUR. Therefore, this method is advisable for expatriates and domestic workers who intend to transfer money to South Africa effectively and efficiently. 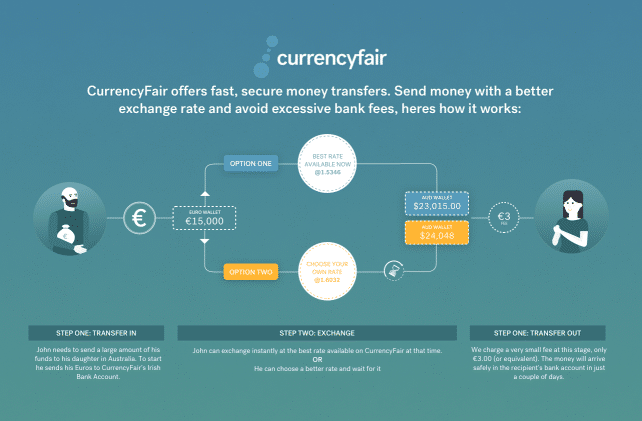 Get the best currency exchange rate - Start your money transfer with CurrencyFair right now!